You know it’s not a Halloween celebration without Cthulhu. He’s a party animal! Also, he’s really good at the “generating screams of pure, unadulterated terror” angle of things. Just between us, though, he does have a tendency to hog the drink. On display here is one magnificent Cthulhu print, donated and signed by the artist, Raven Mimura. 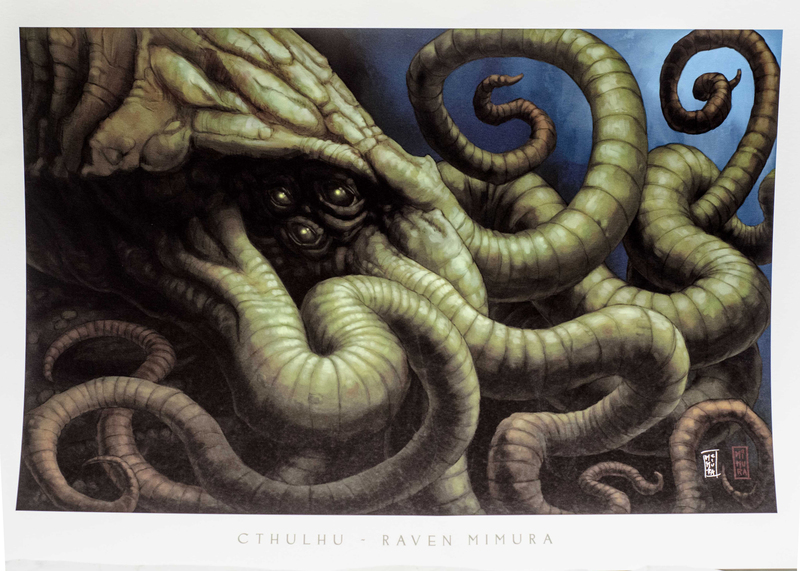 Who, by the by, is an awesome, chatty guy…not at all the sort of teeth-grinding madman one normally associates with those who attempt to paint the Great Old Ones. So maybe there’s hope for humanity, yet! Just kidding…if you’ve read Lovecraft and associates, you know we’re all doomed. But hey, until that happens, you may as well have some awesome art on your walls!